How to request a meter refund from Impark? I was mistakenly charged twice by an Impark meter, thus I contacted the company hoping to get a refund for the invalid charges. After waiting for two months for their response, I concluded Impark didn't give a damn about my issue. They did not even drop me line. So, I wrote this blog entry, which initially I titled "Robbed by Impark? You are not along…". Two days after publishing the post I was contacted by Impark through Tweeter. It turns out my posts are automatically tweeted and somehow Impark noted my tweet. After that, I had to get on the phone with them and I also had to send some emails back and forth with Steve Tirbhowan, a Senior Parking Manager at Impark. Finally, I was refunded on January 9th, 2015 for an issue I had on September 24th, 2014. It took a lot of effort from my part to get the money back. Read the whole story below. Important: If you need to request a meter refund from Impark, I suggest you contact them through their Tweeter page. They pay very little attention to their Contact Us Form; but I discovered that they are are quite responsive on Twitter. If this was useful to you, share it by clicking the Google Plus (G+) button at the beginning of this post. Toronto, September 24th, 2014. Around 10:00 AM in the morning. This is the day I became a Canadian Citizen. This is also the day I was robbed by Impark. I was hoping to park my vehicle in the car park in the picture below. The address is 200 Town Centre Court, Scarborough, Ontario. This is the closest parking lot to the CIC office in which I was to have my citizen ceremony. There are a couple of Impark parking meters in that place. I inserted my MasterCard in the machine (twice), but it reported some kind of error. At the end the machine didn’t deliver any ticket or receipt; which is why I had to leave the premises and find a different place to park. I ended up parking in a different place no far away. You can see my parking ticket below. Hurrah! I was ready to become a Canadian citizen. 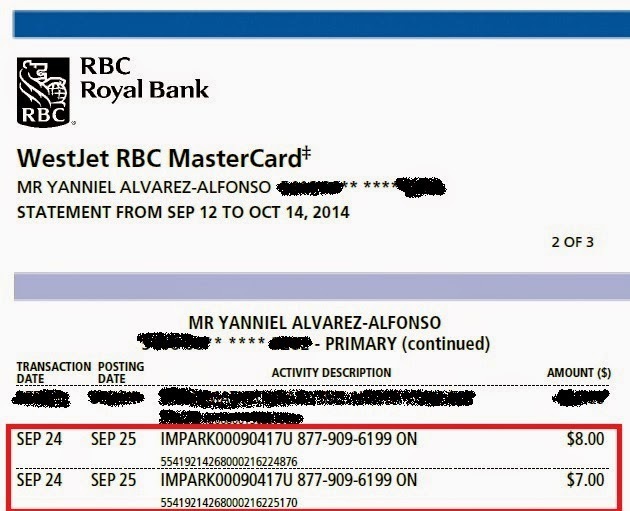 A few days later when I was browsing my credit card statements, I noticed two payments to Impark. Yes, the defective Impark meter charged me twice and never delivered the ticket/receipt. So, I was charged for nothing. I understand that technical problems can happen. So, I contacted Impark twice and asked for a refund. I used their own Contact Us form. They never took the time to even write me a line over email. Almost 3 months have passed since then and I have come to the conclusion that I have been robbed and treated disrespectfully by this entity. 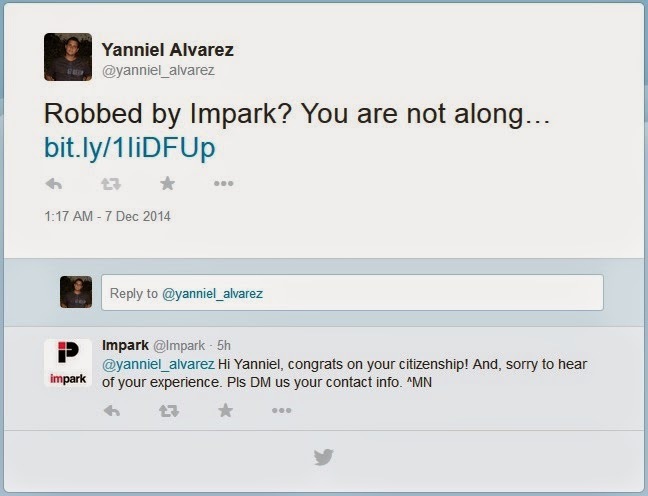 Now you know: I was robbed by Impark the same day I became a Canadian Citizen. I certainly won’t forget this day. If you have been wronged by Impark as well, please; share you story on the comments section or click the Google Plus (G+) button at the beginning of this post. Let’s call Impark for what it is: a thief company. Below, I am adding the communications that I sent to Impark. I never got an answer from them. To prove my story is real, I am also inserting a snapshot of my credit card statement showing the two payments done to Impark. the premises not being able to park. able to use the service for lack of the receipts. Impark made. It's only fair that you correct the issue ASAP. Update: Two days after writing this blog entry I was contacted by Impark via Twitter. They asked for my contact information, which I provided to them via Twitter's Direct Message. After this, a support person named Zach called me. I explained the issue to him and he advised me to email my explanation directly to customersupport@impark.com. He said I should provide the first 4 and last 4 digits of my credit card so that they could look-up (verify) the erroneous transactions of September 24th, and then issue a refund. I emailed the info to customersupport@impark.com as Zach told me to. Guess what? Another month has passed and nobody from Impark has contacted me. Rogue companies like this one should not be allowed to operate. There's no protection for the consumer that deal with Impark. This has never been about the money. It's about principles. I don't appreciate being robbed, even if it is just a dollar. This is about calling Impark for what it is: a thief company. I paid $47.25 for 2 hr parking at impark calgary. They dont refund. What an unfortunate day for me.